Holman, H.t. and Andrew Robb. "Prince Edward Island". The Canadian Encyclopedia, 22 January 2019, Historica Canada. https://www.thecanadianencyclopedia.ca/en/article/prince-edward-island. Accessed 19 April 2019. Prince Edward Island is Canada's smallest province, making up just 0.1 per cent of Canada’s total land area. It is situated in the Gulf of St Lawrence and separated from Nova Scotia and New Brunswick by the Northumberland Strait. PEI was known to its earliest settlers, the Mi’kmaq as Abegweit, meaning "cradle in the waves,” and was described by Jacques Cartier in 1534 as "the fairest land that may possibly be seen." PEI's deep red soil has always been its most striking feature and, together with the sea, the mainstay of the population since the early 18th century. PEI’s landmass is of relatively recent origin in geological terms. An enormous sedimentary basin underlying the present Gulf of St Lawrence was created by freshwater streams that drained ancient highlands. The ice ages left an imprint on the land, especially during the late Pleistocene period between 75,000 and 10,000 years ago. When the last glaciers receded, uncovering what is now PEI, glacial debris and the marks of glacial scouring were left on the exposed land, which began gradually to assume its present character. 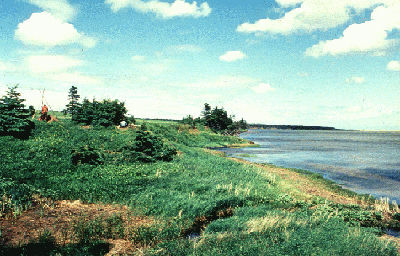 Because of lower ocean beds and land depressed by the glaciers' weight, the Island was connected to the mainland by a low plain covering much of the present Northumberland Strait. As ocean levels rose with the melting of the glaciers, and as the land rebounded, the crescent shape of the Island emerged about 5,000 years ago. PEI extends for 224 km, with a width ranging from four to 60 km. The present land surface ranges from nearly level in the west to hilly in the central region, and to gently rolling hills in the east. The highest elevation is 142 m in central Queens County. 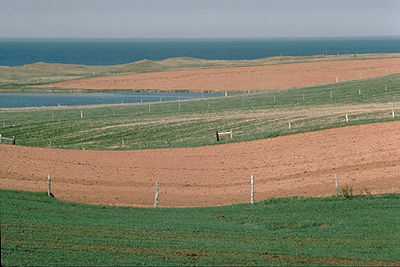 The deep red soil of PEI is the result of a high concentration of iron oxides in the rock (photo by Freeman Patterson/Masterfile). The Island's predominant reddish brown sandy and clay soils are occasionally broken by outcroppings of sedimentary rock, most commonly a red-coloured sandstone or mudstone. The heavy concentrations of iron oxides in the rock and soil give the land its distinctive reddish brown hue. The coastline is deeply indented by tidal inlets. The north shore of the Island, facing the Gulf of St Lawrence, features extensive sand-dune formations. These shifting sands pose problems for fishermen by clogging harbour entrances, but they provide a haven for summer tourists. 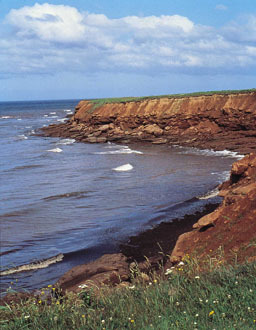 The shoreline of PEI alternates between headlands of steep sandstone bluffs and extensive sandy beaches (photo by Richard Vroom). The pristine coast of Prince Edward Island overlooks the Gulf of St Lawrence (courtesy Colour Library Books Ltd.). The shoreline of the Island generally alternates between headlands of steep sandstone bluffs and extensive sandy beaches. Many of the Island's harbours have been created by dredging tidal runs and are usable only by vessels of shallow draught, such as inshore fishing boats. A few natural harbours, such as those of Summerside, Charlottetown, Georgetown and Souris, provide access and shelter for larger vessels. Little is left of the original forests of the Island; three centuries of clearing for agriculture and shipbuilding, as well as fire and disease, have radically transformed them. During the 19th century, the upland areas of the province were forested with beech, yellow birch, maple, oak and white pine. As of 2000, most of the woodlands have deteriorated into a mixture of spruce, balsam fir and red maple. The Island climate is moderate. Winters are long but relatively mild, and springs are late and cool. Summers are cool and marked by prevailing southwest breezes. Average mean maximum temperatures are approximately -3°C in January and February, and 23°C in July. The mean minimum temperature drops to approximately -26°C in January and February, and 14°C in July. The Island is relatively free of fog year-round, unlike neighbouring provinces. Annual rainfall is approximately 1,125.8 mm, while the annual snowfall is 318.2 cm, ensuring adequate groundwater supply. The waters of both the Gulf of St Lawrence and Northumberland Strait are warmer in summer than the coastal waters of Nova Scotia and New Brunswick, although in winter ice covers both the strait and the gulf, and icebreakers are needed to keep shipping lanes open. Drift ice is often found in Island waters as late as the latter part of May, causing difficulty for fishermen and slowing the arrival of spring. Conservation is a major concern of government and public interest groups in the province. Over-cropping, extensive mechanization, reliance on chemical fertilizers and removal of hedgerows has led to considerable wind and water erosion	of some of the Island's best land. It is estimated, for example, that up to five tonnes of soil per hectare can be eroded from an unprotected plowed field in one year. This soil erosion has also led to heavy siltation of the creek and river systems, turning many streams, navigable in the last century, into shallow and unusable creeks. Another major concern is the purchase of large tracts of land by non-residents for recreation or development and by vertically integrated business for farming. Both problems led to the establishment of a Royal Commission on Land Use and Ownership, and to the subsequent creation of a Provincial Land Use Commission (now part of the Island Regulatory and Appeals Commission), which regulates zoning, ownership and development questions. Groups such as the PEI Nature Trust have attempted to bring public attention to many of PEI's imperilled natural areas, but most of the land is privately owned and vulnerable to inappropriate development, misuse or unwitting neglect. The first inhabitants of PEI were ancestors of the Mi’kmaq. There is evidence they occupied sites on PEI as many as 10,000 years ago by crossing the low plain now covered by Northumberland Strait. Occupation since that time has most likely been continuous, although there are some indications that there may have been seasonal migrations to hunt and fish on the Island as well. The Mi’kmaq have inhabited the area for the last 2,000 years. The first European to record seeing the Island was Jacques Cartier, who landed at several spots on the north shore during his explorations of the gulf in the summer of 1534. Although there was to be no permanent settlement for almost 200 years, the harbours and bays were known to French and Basque fishermen, but no trace of their visits has survived. French settlement of the Island (then known as as Île St-Jean) began in the 1720s. The colony was originally a dependency of Île Royale, although a small garrison was stationed near what is now Charlottetown. Settlement was slow, with the population in 1748 reaching just over 700. However, with increasing British pressure on the Acadian inhabitants of Nova Scotia culminating in the decision to expel them in 1755, the population of the Island was significantly increased. Some 4,500 settlers were on the Island at the fall of Louisbourg in 1758, but the British quickly forced all but a few hundred to leave, even though the colony was not ceded to them until the Treaty of Paris	(1763). Under the British administration the name of the Island was anglicised to the Island of Saint John. This was the first of the new possessions to benefit from a plan to survey all of the territory in North America. Surveyor General Samuel Holland	was able to provide detailed plans of the Island by 1765. He divided it into 67 townships of 20,000 acres each. Almost all of these were granted as the result of a lottery held in 1767 to military officers and others to whom the British government owed favours. With the exception of small areas surrounding the land allotted for towns, there was no crown land. The proprietors were required to settle their lands to fulfil the terms of their grants, but few made an effort to do so. As a result the Island had vast areas of undeveloped land, yet those who wished to open up farms often had to pay steep rents or purchase fees. Some proprietors refused to sell land at all and settlers found that they had no more security of tenure than they formerly had as tenants in England or Scotland. Further, the costs of the administration of the Island were to be borne by a tax paid by the proprietors on the land they held. This was often impossible to collect, and efforts made by the local government to enforce the terms of the grants were usually overruled by the British government under the influence of the landowners, most of whom never set foot in the colony. The land question was the dominating political concern from 1767 until Confederation. Confrontation between the agents of the proprietors and the tenants frequently led to violence, and attempts to change the system were blocked in England. During the 1840s the government was able to buy out some of the landowners and make the land available for purchase by the tenants, but funds available for this purpose were quickly exhausted. In spite of these difficulties the population grew from just over 4,000 in 1798 to 62,000 around 1850. Although there was an influx of Loyalists after the American Revolution, the majority of the newcomers were from the British Isles. Several large groups were brought from Scotland in the late 1700s and early 1800s by landowners such as Captain John MacDonald and Lord Selkirk, and by 1850 the Irish represented a sizable proportion of the recent immigrants. After 1758 the Island was administered from Nova Scotia and later, in 1763, became part of that province. In 1769, however, following representations made by the proprietors, a separate administration was set up complete with governor, lieutenant-governor, council and assembly. In 1799 the name of the colony was changed by the assembly to Prince Edward Island to honour a son of King George III stationed with the army in Halifax at the time. With rapid growth in the second quarter of the 19th century, demands came for more effective control over the affairs of the colony by the elected assembly. Although the concept of representative government had been accepted since 1773, the administration was still dominated by the appointed executive council. In 1851 responsible government was granted to the colony and the first elected administration under George Coles	took office. The period was not a politically stable one, however, for in the next 22 years, a total of 12 governments were in office. The land question continued and, in addition, matters such as assistance to religious schools divided the population. The Charlottetown Conference of 1864, the first in a series of meetings leading to Confederation, was held in the colony, and it marked the beginning of a period of political change that would leave a deep imprint. The meeting was called to discuss maritime union, but when visiting representatives from Canada began to promote a larger union, the original proposal failed to capture the imagination of Islanders. The enticements offered by the Canadians included an absorption of the colony's debt, year-round communication with the mainland, and the provision of funds with which the colony could buy out the proprietors and end the land question. Although few Islanders displayed much enthusiasm, most accepted the union as a marriage of necessity. The post-Confederation period brought severe hardships to the Island's economy and population as new technology, the National Policy and other forces combined to reduce the Island's prosperity. Although the province reached a population level of 109,000 in 1891, the lure of employment in western and central Canada, and in the US led to a drain on the population, which had slipped to 88,000 by the time of the Great Depression. Dominion-provincial relations dominated the political sphere as the Island sought to increase its subsidy from Ottawa, retain the level of political representation it had enjoyed at Confederation, and finally establish the continuous communication with the mainland that was promised in 1873. Throughout the first half of the 20th century, the economy of the province was stable, with only slight changes in both farming and fishing — with the notable exception of the fox-farming industry between 1890 and 1939. By the mid-1960s, however, the situation had changed considerably. The number of farmers and fishermen had dropped, and the economy, which had lagged behind the rest of Canada, was in serious trouble. Due to recent booms in PEI’s natural resource industries, the province has experienced several decades of relative stability. Important, however, are the continuing efforts to bring in new industry while still maintaining elements of the province’s history and heritage. The Mi’kmaq can trace their ancestry on the Island as far back as 10,000 years ago. Upon the arrival of the Europeans, they were left with small parcels of land of poor quality, and suffered from disease and high unemployment. Late in the 20th century and into the 21st, PEI’s total Aboriginal population slowly began to grow. They accounted for 0.7 per cent of the province’s population in 1996, 1 per cent in 2001, and approximately 1.3 per cent in 2006. The majority of the Acadian population can be traced to several hundred Acadians who escaped deportation at the time of the British occupation of the Island following the fall of Louisbourg in 1758. Today, approximately 2.4 per cent of PEI’s population claims Acadian descent. English, Scots and Irish arrived in the late 18th and early 19th centuries, and by 1861 the population of the Island grew to just over 80,000. Thereafter growth slowed and following 1891, natural increase was unable to keep up with the number of Islanders leaving, especially for New England. Most of the other ethnic groups on PEI are the result of immigration in the last 50 years. The 1950s and 1960s were periods of slow population growth as Islanders continued to leave the province in search of economic opportunities elsewhere. In-migration in the 1990s, combined with natural increase, caused the population to grow to 136, 200 in 1996. In 2016, PEI’s population was 142,907, representing a 1.9 per cent increase from 2011. Despite this growth, the population only represents about 0.4 per cent of the Canadian total. As with other provinces, PEI’s urban population steadily increased throughout the 19th, 20th and 21st centuries, but at a much slower rate than seen in most other provinces. Between 2001 and 2006, PEI’s urban population grew by only 0.8 per cent while its rural population declined by 12.8 per cent. Nevertheless, 45 per cent of PEI’s population dwelled in urban areas as of 2016. PEI’s capital city, Charlottetown, is also its largest, with a population of 36,094 in 2016. Growth in the capital region has been most notable in the suburbs, but the city’s population grew by 4.4 per cent between 2011 and 2016. Charlottetown is the seat of most government offices, the provincial university, the Confederation Centre of the Arts and the art gallery. At one time the city was a major port, but in recent years the number of vessels entering has declined significantly, although efforts by several agencies have resulted in regular visits by summer cruise liners. In 1984, the federal Department of Veterans Affairs was moved to the city, resulting in an increase in federal government employees in the area. The next largest urban centre is Summerside. Summerside's principal economic bases are agricultural service industries and government offices. In 2016, the sectors employing the most people on PEI were health care and social assistance, retail trade, and public administration. Male and female employment rates are approximately equal, but unemployment across the province is a chronic problem. The unemployment rate in PEI is among Canada’s highest, at 12.3 per cent in 2016. Along with Canada's Eastern Arctic, PEI is one of the most culturally homogeneous regions in Canada. The overwhelming majority of the Island's population (91.5 per cent) reported English as their mother tongue in the 2016 census, while only 3.8 per cent of the total population reported French. The most commonly reported ethnic origins were Canadian, Scottish and English. Visible minorities comprise 4.8 per cent of the population, with Chinese, South Asian and Black people making up the largest visible minority communities. Indigenous people (including First Nations, Métis and Inuit) make up 2 per cent of the population. Christianity is PEI’s central religion, with about 93 per cent of residents identifying with a Christian denomination, according to the 2001 census. Until recently religion played an important role in Island life. Geography has dominated the economic history of PEI. In the 18th and 19th centuries its insularity was a benefit. Produce and manufactured goods had to travel only short distances before they could be loaded aboard cheap water transportation and the forests of the Island provided the resources for shipbuilding, which became a major industry in the mid-1800s. The prosperity of the Island was further reinforced by the Reciprocity	Treaty of 1854 that led to increased export of agricultural products to the US. At the time of Confederation trade links were well established along the Atlantic seaboard and with the United Kingdom. However, the shift of focus after 1873 towards central Canada and western expansion, together with changes in technology, left the Island — which was a relatively strong economic partner in Confederation — in a weakened condition that has persisted to this day. PEI was not prepared for the industrial age. It lacked coal and water resources essential to industrial development, and the cost and availability of transportation proved to be a difficulty not easily overcome. Industries on the Island were soon crushed by larger and more efficient plants in central Canada, but at the same time the National Policy provided no protection or markets for the Island's natural products. The change in technology was most strongly felt in the shipbuilding industry. As the wooden sailing ship was replaced by steam vessels constructed of iron and steel, the entire industry died, having neither the raw materials nor the capital to make such a fundamental shift. One activity in which the Island did provide a successful lead was in fox farming. Beginning in 1890 with the work of industry pioneers Charles Dalton and Robert Oulton, the province became the centre of a lucrative silver fox pelt industry. Fox breeding became very widespread, with many Island farmers supplementing their limited income from traditional agriculture in this way. By the late 1930s new technology, changing fashions and the Great Depression caused a rapid decline in the industry. Several fox farms survived into the postwar period, but have since steadily declined. Although there was more stagnation in the economy than an absolute decline, by the early 1950s the per-capita income in PEI was just over half the national level and the outlook for the future was bleak. The post-Second World War development of what amounted to new national policies had the most profound impact on the Island. Income support programs, human-services programs and new federal-provincial fiscal policy dramatically altered the Islanders' way of life. Attempts to alleviate regional disparities by using forced economic growth have caused a social revolution. Despite personal income levels remaining below the national average, these government programs helped increase income and provide markedly better health and educational facilities. The Federal-Provincial Comprehensive Development Plan, begun in 1969, has been central to much of this development. This new period of development through government intervention also had negative consequences. Increasing dependence has been the principal cost. Recently, government initiatives have focused on further developing PEI’s natural resources and tourism	in addition to attempting to diversify the Island’s economy by including new and more technological industries. Agriculture is one of the province’s most important industries, and potatoes the most important crop. 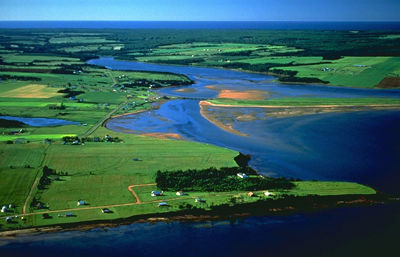 Foxely River, PEI (John MacGregor/Corel Professional Photos). In the latter half of the 20th century there were major changes in agriculture on Prince Edward Island. As late as 1951 over 90 per cent of all farms on PEI had horses, for a total of 21,000 animals. By 2011, only 1,481 horses and ponies inhabited the island, and fields used to produce the huge amount of forage for these animals have been turned to other uses. The number of farms has steadily declined over the last 60 years. Between 1951 and 1996 the number of farms dropped from 10,137 to 2,217, and further dropped to 1,495 in 2011. While the number of farms has decreased, in the 20 year period between 1987 and 2007 the average size increased 53 per cent, from 238 acres to 365 acres. Despite the size of their properties, net farm income (about $3.1 million in 2012) is becoming a smaller portion of total income earned for PEI farmers. In 2006, for example, 43 per cent of farmers reported off-farm income. Total farm cash receipts in 2012 were $467 million, representing an increase of 26 per cent since 2002. Of this total the most profitable single crop was potatoes, which earned over $246 million. 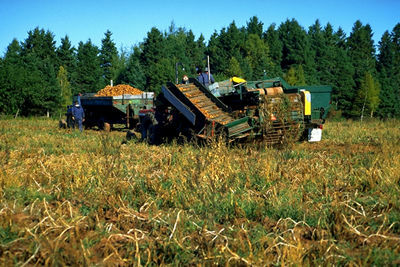 Potatoes flourish in the soil and climate conditions found in PEI. The province is the nation's largest supplier of potatoes and the second-largest supplier of seed potatoes. Table stock is either sold fresh in eastern Canada and the US, or processed into French fries and other potato products. Dairy farms and beef production also represent a significant portion of PEI’s agricultural sector. The provincial and federal governments have put in place a large number of programs to halt the exodus of farmers from the industry and to increase farm incomes. They have had some success, but the high cost of entering the industry remains a problem. At the same time, the average age of farmers has increased from 48 years in 1997 to 51 years in 2007. Both levels of government are active in agricultural research and Agriculture Canada maintains a large research facility in Charlottetown. The Atlantic Veterinary College on the campus of the University of Prince Edward Island has a significant impact on both animal and aquatic research benefiting the fishing industry. Tourism, construction, primary resource-related manufacturing and services are the major industries of PEI. 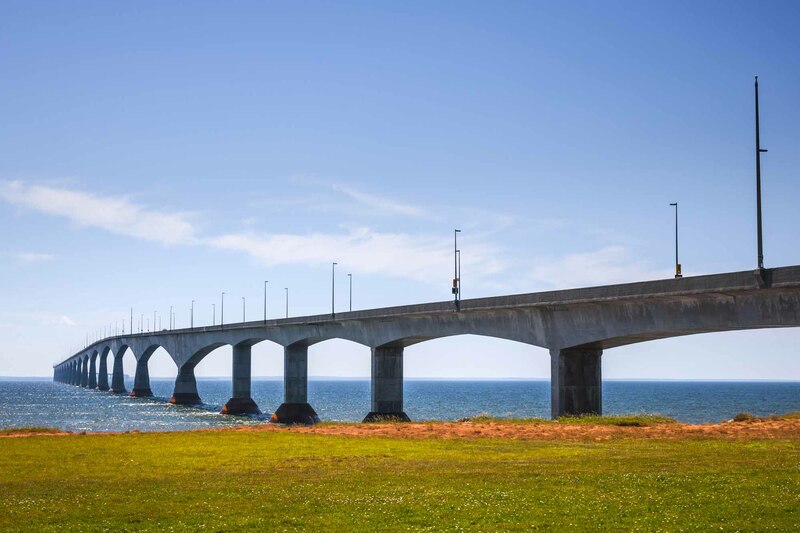 Since 1945, through exploiting the appeal of PEI's unspoiled landscape and sandy beaches, tourism has emerged as a major industry, growing significantly in the last three decades. However, it has sometimes brought inappropriate and random development, dependence on low seasonal wages and loss of land to off-Island owners. In 2000 the island attracted about 1.2 million tourists who spent over $301 million. By 2010 this number had increased slightly to over 1.3 million, generating $370 million in revenue. 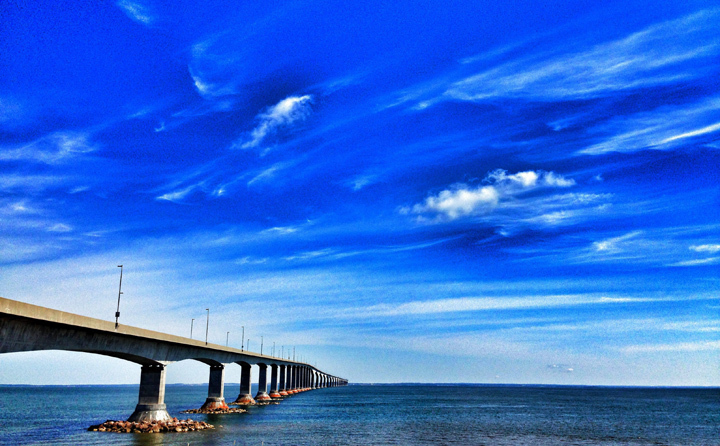 The completion of the Confederation Bridge in 1997 greatly increased tourist visits. Since the 1960s, the government has been deeply involved in the construction and operation of attractions and accommodations. However, the major attraction remains the fine, warm sandy beaches along the 1,107 km of shoreline. Golf, deep-sea fishing and horse racing are among the sports available for tourists. Golf is particularly well-funded and recently gained much attention through exposure on the Golf Channel. In the last decade, government and private developers have established a number of heritage attractions, including sites operated by the Prince Edward Island Museum and Heritage Foundation. New cruise terminals, online reservation systems, improvements to provincial parks and active marketing campaigns have all helped to increase tourist traffic to the island in recent years. 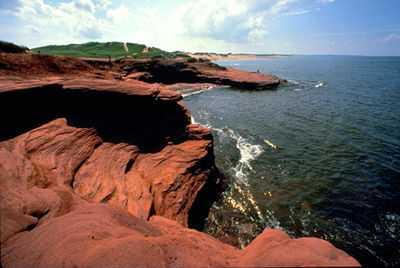 Attempts have been made to divert tourists from the central part of the Island, which is dominated by Prince Edward Island National Park, to eastern and western parts of the province, which have benefited less from the tourist dollar. A major problem is the shortness of the season, which consists of only eight to 10 weeks in July and August. Mineral resources have not been discovered in commercial quantities on the Island, although trace deposits of coal, uranium, vanadium and other minerals exist. Since 1940, drilling has revealed the existence of natural gas beneath the seabed off the northeast part of the province, but its full natural gas supply is unknown because only exploratory wells have been drilled. Mining to date has been restricted to open-pit removal of gravel, but the latter is of low quality and in insufficient quantities to meet even local demand. 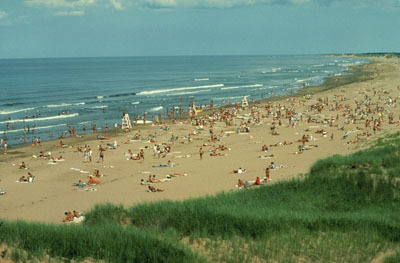 Sand mining was a prevalent along PEI’s beaches until 2009, when the Department of Environment, Energy and Forestry stopped issuing sand mining permits. A study linking sand mining to the erosion of coastal beaches prompted the decision. As of 2008, PEI has opted to develop energy initiatives over its mining sector. Forestry is relatively undeveloped on the Island because of the depleted state of the woodlands and lack of effective management of the remaining resource. It was a principal industry in the 1800s, when most of the best timber was harvested. Since then forests have regenerated in species of little commercial value. Today, forests are being reconsidered as a source of both fuel and lumber for provincial use. Many Island homes are now being heated, at least in part, by wood fuel. Recent tax exemptions and financial incentives for wood heating systems helped re-establish wood and wood pellets as viable heat systems on the island. Fishing is one of the most important resource sectors on the Island. The total value of fish landings (i.e. catch brought ashore) increased by about 37 per cent from 2009 to 2012, from $124.6 million to $170.4 million. Lobster is by far the most valuable species. In 2012, the landed value of lobster was $113.8 million, more than double the value of other shellfish, including scallops and oysters, which accounted for $45.4 million in 2012. Pelagic and estuarial fish (e.g. Arctic char), as well as groundfish such as cod, are also caught in the Island’s waters. Historically, another important industry in the western part of the Island was the harvesting of Irish moss, a marine plant that, when processed, yields carrageenan, an emulsifying and stabilizing agent used in many food products. However, the industry is steadily declining. Transportation to and from the Island by sea is currently handled by two ferry systems. Northumberland Ferries Ltd, a private company heavily subsidized by the federal government, operates between Wood Islands, PEI, and Caribou, Nova Scotia, from May to December, closing when ice and weather become severe. The second ferry service, C.T.M.A, runs from Cap-aux-Meules, Îles-de-la-madeleine to Souris, PEI. 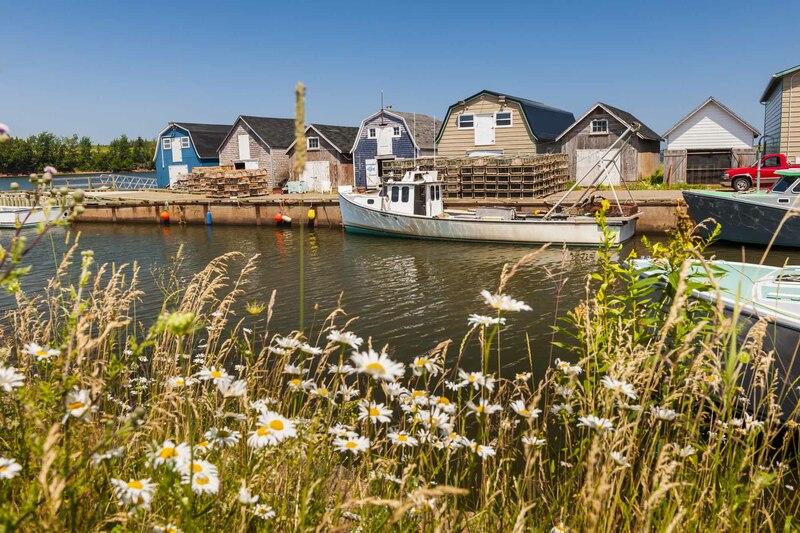 Souris is one of PEI's main ports and fishing communities (photo by Barret and MacKay). 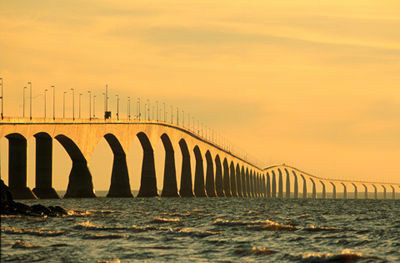 Getting to and from the Island also takes place via Confederation Bridge, which links PEI to New Brunswick. It opened in May 1997 and at 12.9 km, it is the world's longest bridge over ice-covered water. The bridge is curved to keep drivers alert and reduce accidents, and the average crossing takes about 10 minutes. Discussion about the bridge began in earnest in 1987, when proposals for constructing a fixed link in the form of a bridge or tunnel came forward from the federal government and private developers. In January 1988, a plebiscite was held on the question by the provincial government of Premier Joe Ghiz. In this controversial vote, 59 per cent of Islanders voted in favour of a fixed link. Construction took four years and cost a total of $1 billion. Over the years, the road network within the province has been substantially improved and now almost all primary and secondary routes are paved, which has greatly increased the use of road transportation in the shipping of primary and manufactured products. Additionally, the province is connected to major Canadian centres by daily air routes operated by West Jet and Air Canada. Energy costs are one of the most serious problems facing PEI. Because the Island has only small ponds, few significant rivers, and generally low elevation, water power is seldom used. In the last century, numerous gristmills and sawmills used the limited hydropower available, but few survive today. Lacking hydroelectric capability, the Island is forced to rely on fossil fuels to generate power and on electrical power transmitted from New Brunswick via submarine cable. As of 2012, 76 per cent of PEI’s energy supply was from imported oil and almost half a billion dollars is spent annually on imported energy sources. Since there is no potential for large-scale hydroelectrical development, alternative energy sources such as wind, solar and wood-fired generators are being investigated. In 2012, wind energy accounted for roughly 18 per cent of PEI’s energy supply while biomass accounted for another 10 per cent. Government was established in PEI by order-in-council in 1769, but it was not until the post-Confederation period that the modern structure and practice of government emerged. There is a lieutenant-governor appointed by the governor general for a five-year term. The executive council, or Cabinet, usually consists of 10 members responsible for single or multiple departments and is headed by the premier. The legislative assembly has representatives from 27 constituencies. Because of their size, Charlottetown elects five members and Summerside two. Many of the constituencies are rural and small, some having barely 2,000 voters. When PEI entered Confederation it had a bicameral legislature, an upper house or council elected by property owners, and an assembly elected by universal male suffrage. As provinces moved in the late 19th century to abolish upper houses, a unique compromise emerged in PEI. A single legislative assembly was created in 1893, but for each constituency there was one candidate designated a councillor and one an assemblyman. Property owners elected the councillor and all males the assemblyman. Persons holding property in more than one riding could vote in each riding, a system that led to all manner of obvious abuses. This property qualification was maintained until 1963, and the practice of electing a councillor and an assemblyman from each district continues to the present. The franchise was extended to women in 1922. Because the population is almost equally split between Roman Catholics and Protestants, a practice developed of ensuring that opposing candidates in provincial elections faced a coreligionist, but in recent years this tradition has weakened. The emergence of fairly stable political parties in PEI was a product of the 1870s. From that time to the present, the Liberal and Conservative parties have dominated the electoral scene. Although a provincial NDP organization exists, and although the CCF/NDP has run candidates in both provincial and federal elections since the 1940s, no third-party candidate has ever come close to gaining a seat in the legislature. Owing to the small size of constituencies and the nearly even division of political allegiances, elections tend to be decided by narrow margins. See: Premiers of Prince Edward Island. The judicial system consists of the Supreme Court, which has Estates, Family and Trial divisions, and which sits on appeals en banc (i.e., when a case is presented to the entire bench of judges in a district), provincial courts and the Small Claims Court. There are no county courts in the province. The provincial government depends heavily on federal transfers. In 2012–13, the province received $509 million in major transfers, accounting for 34 per cent of its revenue — a higher percentage than any other province in the country (excluding the territories). In April 2013, PEI introduced a harmonized sales tax (HST) replacing the provincial sales tax, and the federal goods and services tax (PST and GST). At 14 per cent, PEI has one of the highest sales taxes in the country. The Island is represented by four members of Parliament, elected from the ridings of Egmont, Malpeque, Hillsborough and Cardigan, and four senators. When PEI entered Confederation in 1873 it was entitled to six members, but declining population relative to the rest of Canada reduced this figure to five in 1892 and four in 1904, and by 1911 it was entitled to only three members. After vigorous protests, the British North America Act was amended in 1915, stating that no province should have fewer members of Parliament than senators. As a result, PEI is guaranteed its current four seats. There are three levels of municipal government in the province: city, town and community. Charlottetown and Summerside are the only cities, governed by a mayor and councillors, elected for four-year terms. The seven towns are also governed by mayors and councillors, while the 64 communities are governed by a chairperson and councillors. The Island is reasonably well served by hospital and health facilities, especially since the introduction of a provincial health-care plan in the late 1960s providing non-premium medical and hospital services. There are seven hospitals in the province, the largest hospital being the Queen Elizabeth Hospital in Charlottetown. As in other provinces, health-care costs have risen sharply. A comprehensive ground ambulance system was established in 2006 and two rapid response units have recently been established to better serve rural Islanders. Air ambulance service is provided by Nova Scotia and New Brunswick when patients require immediate transportation. The public school system originated in the Free Education Act of 1852, and authorized the establishment of autonomous school districts based on local communities. Each of the 475 districts was entitled to a one-room school; usually offering grades one through 10. The school districts were governed by local boards, which collected taxes, hired teachers and organized volunteer services. Along with the church and the general store, schools became focal points in each community. This system served the Island well in the 19th and early 20th centuries, but began to show serious deficiencies by the 1920s and 1930s. Inadequate facilities, lack of opportunities to study beyond grade 10 (except for a fortunate few who could attend high school in Charlottetown) and poorly paid, under qualified teachers all began to reach public attention. By 1956 per-capita expenditures for elementary and secondary education were the lowest in Canada — $92 compared with the $279 Canadian average — and by the 1960s the local schools, while providing an essential focus of community life, had fallen far behind Canadian educational norms. The Comprehensive Development Plan provided the vehicle and the rationale for transforming the Island educational system. Beginning in 1972 the many small school districts were replaced by five regional boards, and the process of closing schools and building new, consolidated institutions began. In 1971 there were 189 schools; by 1994 that number had declined to 70. New regulations requiring university degrees for teachers were introduced, and teachers' salaries rose from an average of $5,724 in 1971 to $41,199 by 1994. As of 2011, most teachers in PEI could expect to earn between $47,135 and $76,289 annually. During the 2011–12 school year, 20,831 students were enrolled in public school system. This is over a 10 per cent decrease from 10 years earlier, when 23,449 were enrolled in 2001–2. This is not a new trend: enrollment has been decreasing since the mid-1970s, due in large part to low birth rates and an aging population. While enrollment is decreasing, spending is not. In 2009–10, $10,425 was spent per student in grades one through 12, up from $7,607 in 2004–5, an increase of 37 per cent. Also of note: full-day kindergarten was introduced in 2010; and during the 2011–12 year, PEI had the lowest teacher to student ratio in Canada. Higher education in PEI began with the creation of Prince of Wales College (1834) and St Dunstan's University (1855). These two institutions were small and separated along religious lines. In 1969 they merged to form the University of Prince Edward Island, located in Charlottetown. Holland College is the Island’s community college. The rich cultural heritage of PEI developed as an integral part of the community partially because of the relative isolation of the province. Even within the province there was little communication between the Acadian communities in the western part of the Island and the predominantly Scottish communities in the southeast. Although the French language and Acadian culture have been strengthened in recent years, the Gaelic language has all but disappeared. Because of threats to the cultural life of the province, many groups actively support aspects of the Island's cultural heritage. The provincial government assists these groups and funds a wide variety of activities. The Prince Edward Island Museum and Heritage Foundation, for example, not only administers historic sites but is also active in collecting and interpreting material culture. The Prince Edward Island Council of the Arts also assists and encourages local cultural development. Both Holland College and the University of Prince Edward Island are vital contributors to the contemporary cultural life of the Island. The Confederation Centre of the Arts was built as a memorial to the Fathers of Confederation in 1964 to mark the 100th anniversary of the Charlottetown Conference. The centre is a major arts complex with three theatres, an art gallery and a public library. The gallery has a fine collection of Canadian art and features a large collection of the works of Robert Harris, a portraitist of the late 19th and early 20th century whose most notable work is the group portrait of the Fathers of Confederation. The 1,100-seat main stage theatre is home to the Charlottetown Summer Festival, a showcase of Canadian musical theatre. At present there is an active artistic community on the Island and in addition to the Confederation Centre Gallery, there are several other private and public galleries. While the province is the home or birthplace of a large number of popular and academic writers, none is as well-known as Lucy Maud Montgomery, author of Anne of Green Gables. Most of Montgomery's stories are set on the Island and each year thousands of visitors come to see places mentioned in her books or associated with her life. The Prince Edward Island Arts Guild officially opened in 1994. The building is the headquarters for many of the Island's arts organizations, including the Prince Edward Island Council of the Arts. PEI is served by English-language CBC radio and by English- and French-language CBC television. The CTV television network also covers the Island, but is not produced locally. Four private radio stations broadcast in Charlottetown and one operates in Summerside. Cable television systems operate in all Island population centres, offering a wide range of programs, mostly of US origin. There are two daily newspapers published in the province: the Guardian in Charlottetown and the Journal-Pioneer in Summerside. Three weekly papers are also published on the island: the Eastern Graphic, published in Montague; the West Prince Graphic, published in Alberton; and La Voix Acadienne, a French-language paper, produced in Summerside. 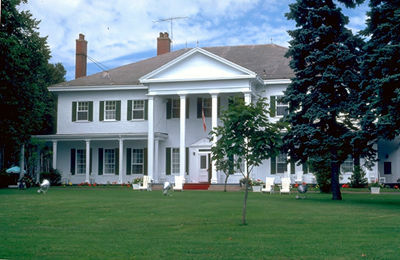 Government House is one of the stately mansions surviving from the 19th century (courtesy Canadian Tourism Commission). PEI, dating 2500 years ago. Many Maritime occur on the shores of saltwater lagoons, which afforded visitors a rich resource area for both land and marine-based animals, fish and birds (courtesy CMC). 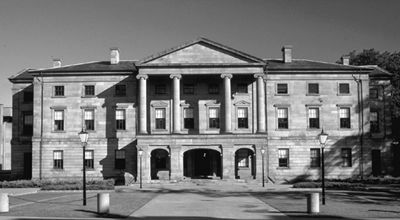 Of Prince Edward Island's many important historic sites, the best known is Province House , the location of the Charlottetown Conference of 1864. Government House, the residence of the lieutenant-governor, is a carefully refurbished early 19th-century building. Other sites include Green Gables, the L.M. Montgomery home at Cavendish, and heritage sites operated by the Museum and Heritage Foundation at Charlottetown, Summerside, Elmira, Port Hill, Basin Head and Orwell Corner. A visitor can appreciate much of the Island's architectural heritage by simply walking in the older areas of Charlottetown or Summerside, or by driving along the country roads. Many fine examples of both rural and urban buildings from the last century are still intact and functional. The Charlottetown Conference and its Significance in Canadian HistoryA paper that chronicles the political discussions and debates amongst the participants in the Charlottetown Conference. From the Canadian Catholic Historical Association.